I was sitting on the couch, drinking my can of Cherry Neocola and reading The Negg Faerie Diaries to pass time. I jumped. I didn't even realize my owner was standing right in front of me. It's like she appeared out of thin air. She does weird things like that sometimes. She nodded. "Good. So you'll be done by tomorrow morning then?" What was she talking about? My book? "Actually, I'm already on the last chapter. I only have a few more pages to go before-" I falter when I see her confused look. "Forget I said anything. Done with what?" Oh gosh! The Random Contest? How could I have forgotten? But no. Instead of saying something like, "Oh darn! I forgot! I guess we'll just have to wait until next week to enter again!" I said, "Oh yeah! That! Yeah I'm done! We're going to win this time, I just know it!" My owner smiled. "I know it too! Remember, it's due at 8:00 AM NST tomorrow morning. Thanks again for taking care of this weeks entry, Sky." I smiled back briefly, then went back to my book so I wouldn't have to meet her eyes. I pretended I was reading, but I was panicking on the inside. How could I have forgotten about the entry? We enter the Random Contest every week! Or at least, we try to. Usually my owner just starts the project, then gets bored and forgets about it until next week. That's why she asked me, the artistic one, to start doing the entries. 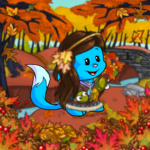 If someone were to see me at that moment, they would have seen a little, lost looking Kacheek while her owner beamed down at her. When I looked up again, my owner was gone. She must have done that weird vanishing thing again. I picked up my book, which must have fallen on the floor during my panic attack. There was a blanket over me and a pillow under my head. Weird. Those weren't there a few minutes ago. Suddenly it all made sense. The pillow. The blanket. My book on the floor. The strange light coming from the windows. "Shoot! I fell asleep!" I shouted out loud, yanking off the blanket. I had to fall asleep when I planned to spend the whole night working on the entry! I immediately pulled all the art supplies I kept in the living room off of the shelves. Wait... what time was it? My owner said the entry was due at 8:00 NST, didn't she. Good thing I wake up at 5:00 AM every day. I'm a morning person, and I'm always up to see the sun rise. I should have a few hours at best. I checked the clock behind me just to make sure. 7:00?! I never wake up this late! But I suppose that's what I get for sleeping at 11:00 PM last night. Still, I had to create an entry and send it in in under one hour? I immediately started cutting, pasting, and drawing everywhere there was room. I was about to take a look at what I'd made so far and see if I could actually make it into something when there was a strange sound coming from behind me. "Whaa?!" I sleepily stuttered, trying to pinpoint the hissing noise. My Christmas Slorg, Jingle, was glaring at me, not looking happy for once. Of course he was upset. I usually take him for his daily walk at 6:00 AM every morning. He was probably itching to get outside. "Not now, Jingle. Can't you see I'm busy?" Jingle roared, looking absolutely furious with sharp teeth and red glowing eyes for exactly one second before his usual grin returned. I stepped back, eyes as wide as his smile. "I g-guess we should g-go now," I stammered in shock. Jingle's smile grew even wider, his eyes brighter than usual. I walked out of the door, careful not to make any noise, while Jingle trailed closely behind me. We went to our usual spot, a shady, quiet spot just behind our neighborhood. But for the first time, there was a group of kids playing ball in a spot that I thought only we knew about. The kids immediately ran up to me. "Is that your Slorg?" the JubJub asked. "He's so cute! You even painted him Christmas!" "Yeah," I replied, putting on a weak smile. "But we'll have to go soon." "Oh, please don't," said the Zafara. "You just got here! Can we pet your Slorg?" I was forced to sit there for what felt like a decade while the little kids played with Jingle. Every time I tried to leave, the kids would start crying and I'd come back. Eventually, I just walked away when the Uni started to give me fashion tips about painting myself. Apparently "the color blue is so out." I was finally able to make it back home and double-lock the door just in case. How much time did I still have? Good. It was only 7:25. I still had enough time... I hoped. I was about to undo the leash to let Jingle free when I realized something. Jingle hadn't made a sound since we'd left those kids, which is completely unlike him. I shut my eyes as I turned my head toward the leash. When I opened them, my fears were confirmed. Jingle was missing. He must still be back at that area with those little kids! I silently promised on Fyora's fiery wrath that I would get them someday. I walked outside and slammed the door, furious. I jogged over to our usual spot and saw those kids from before, holding a small blue blob that was desperately trying to escape. Jingle. I marched up to the group of kids, who dropped Jingle in surprise. I scooped him up into my arms, not looking at the kids. "I can explain," the JubJub started. "It's not what it looks like. We were just-" I reached the end of the street and turned right, drowning his voice out as I headed toward home. I heard him yelling to explain, but his voice was no longer audible. The Uni overlapped it screaming different fashion tips. "Just paint yourself yellow! I promise, you'll look marvelous! Lose the gloves too! Lose the glov-" I opened the front door to my house and slammed it, loudly. I winced. What if I woke everyone up? It sure would be hard to explain to my owner what was going on. 7:40? I'm doomed! I grabbed materials off the tables and started transforming whatever I had made into a big mess called my entry. It was acceptable. I suppose. I just hoped my owner isn't expecting a shiny trophy anytime soon. 7:50. Almost finished... I grabbed a big blue marker and wrote down a title and a description. Materials used: Everything in sight. 7:52. Finished! But now I have to turn it in... I burst through the front door and ran over to the nearest Faerieland Post Office. "Hello. Welcome to the Faerieland Post Office. How may I help y-" the Korbat at the desk faltered when he saw me panting hard, face purple from all the running. His name tag read "Bill Walinski." What a mouthful of a name. "Yes." I panted, still out of breath. "Yes, Mr.-er-Walinski- I'm looking for the spotlight submission section." "Yes, yes of course. And call me Bill. Mr. Walinski is my father." I forced a laugh at his joke. Like I'd never heard that one before. He led me past rooms with various mailboxes in them to a narrow, empty corridor. On the other side was a nearly empty room, aside from the small mailboxes with the names of the spotlights on them. A plaque above the door read "Spotlight Submission." "Which contest are you-" Bill faltered yet again when he saw the big mess of a project in my hands. "The Random Contest is the last mailbox on the right," he said knowingly. "Why do some mailboxes have clocks above them and some don't?" I wondered. "The mailboxes with clocks above them are for spotlights that are timed. Once the spotlight's time limit has run out, the clocks reset, and the mailboxes will disappear. If that's all, I should be going. Good luck in the contest!" "Wait! How do I submit the entry?" I asked. "Those mailboxes have no doors." "How do you think?" Bill replied. "Just like everything else in Faerieland, the mailboxes are magical. Put your entry on top of them, and they'll dissolve and be sent directly to the judges." "Thank you!" I waved at Bill as he returned to his place at the counter. I ran to the mailbox with a logo of a ball of mixed items, simply labeled RC. Putting my entry on top, I risked a glance at the clock above the mailbox. All the guilt and worry finally crashed down on me. 8:01. I was late, and now my entry wouldn't go through. The judges would never see it, and my owner would be disappointed in me. She'd ban me from ever making contest entries again and we'd never get a nice trophy to proudly put in our cabinet. All because of one minute. I was a minute late. So why was my entry gone? "Ah. I see you've sent it in?" I turned around and saw Bill peeking in. "Sorry if I scared you. You've been in here quite a while, and I just dropped by to make sure you didn't get lost. It's very easy to lose your way here." "Yes, it is," I replied, smiling at Bill. All of that time and work I spent making our entry, worrying that I was going to be late, but it turned out alright anyway. I thanked Bill again, and walked home whistling. "Did you send in that entry?" my owner asked as I walked through the door. "Yeah, I did. Right on time actually," I replied, glad that I didn't have to fib. "Good. So glad you got it in on time. I can't thank you enough, Sky. I just knew I could trust you!" Oh gosh! Did we forget to tell you guys? *facepalm* We extended the due date to next week! Sorry about that, guys! 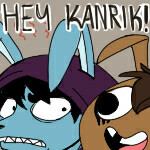 Ever since joining the Thieves Guild, Macha just won't leave Kanrik alone. Satisfy their cravings with a good piece of brain. Yes, I said it... BRAINS! In this game, it's your task to help Edna and her shadow to collect potion ingredients to escape the dungeons and reunite with each other.